Click here for the full list of new releases this week (85). Interesting movies include Sweeney Todd, John from Cincinnati: Season 1, Alvin & the Chipmunks, All This and Heaven Too, The Great Lie, Watch on the Rhine, The Good Night, Festival Shorts Collection, Becker: Season 1, Father Knows Best: Season 1, and Blue Man Group: How to Be a Megastar Live!. New Netflix Website Changes - Your Thoughts? Netflix launched new Homepage, Browse Instantly, and Queue page designs today. The most noticeable changes are page width (too wide? ), bigger DVD images, and lots of white space. 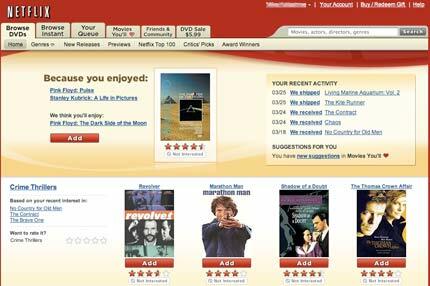 The new welcome message says that "Over time it will change as we learn more about what you like," so it looks like Netflix will be personalizing the movie and genre recommendations on the Homepage as your taste in movies changes. The new Homepage is broken down into rows, and the first asks you to rate a recent return, and gives you an update on your rental activity. The next rows are based on movie genres, and the large DVD images make it easy to scan through the titles (you can actually read some of the text). 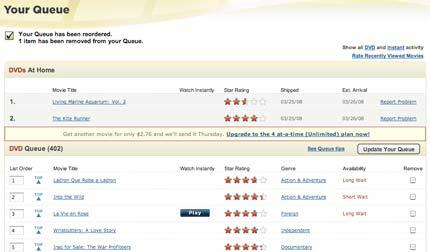 The Browse Instantly page has been updated to look like the new Homepage, with large DVD images, and rows of recommendations based on genres. It also shows you recent Watch Instantly activity, Watch Instantly titles from your queue, and local favorites. The Queue has been changed to be wider, and sports a new "Top" icon. Note: HD DVD and Blu-ray rentals are not showing up on the Your Queue page, but it should be fixed soon. What do you think of the new design? Thanks to BoB, Bradford, Doug, Chris, Nathan, David, Patrick, Reese, Arul, Steven, Ali, Joshua and others for sending this in. Netflix sent out an e-mail this morning to inform customers of an automatic 5% credit for the 11 hour service outage on Monday. Do you think this was the right thing to do? Would you have preferred extra DVD rentals instead? Thanks to Bucky and Sean for sending this in. The Netflix website went back online around 6pm (PT) last night, but movie ratings (stars) are missing. Netflix is shipping movies today (some customer DVDs were delayed due to the technical problems yesterday). Thanks to Harrison, Andrew, Mike, Bruce, Leah, and everyone else for sending this in. Effective April 23, 2008 Peerflix is discontinuing the Marketplace and DVD buy/sell/trade portions of Peerflix.com. While the Peerflix.com web site will be available beyond April 23, 2008, you will no longer be able to buy, sell, send or receive DVDs on Peerflix as of that date. While we have made considerable investments in our marketplace platform over the past four years, unfortunately the escalating costs of operating the marketplace do not make that business viable at this juncture. As we move out of the DVD marketplace business, we are focusing our energy and resources on building the Peerflix Media Network which is now the web's fastest growing vertical movie network. You can read the entire e-mail to customers on the Webware site. The Netflix website was unavailable for approximately 11 hours today, starting around 7am PT. 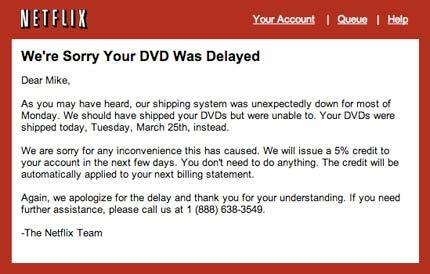 CNet discovered that Netflix changed the "Temporarily Unavailable" notice at some point during the day to remove the assurance, "distribution centers are still sending and receiving DVDs." The Associated Press reported "Swasey says DVDs that normally would have been mailed Monday may not go out until Tuesday because the problem also has hobbled some Netflix distribution centers." Did your Netflix movies ship today? Update: Netflix spokesperson Steve Swasey on the outtage: "It's unanticipated and our engineers are working feverishly on it. We regret the inconvenience and appreciate the patience of our members." The Netflix website has been down for several hours this morning, with the notice: "Our site is temporarily down." The site originally reported an error around 3 hours ago. Thanks to Amy, Troy, Tedder, Griffith, Alan, John, Kyle, Brian, Ali, Jeb, Bruce, Greg, Paul and others for sending this in. Click here for the full list of new releases this week (132). Interesting movies include The Kite Runner, The Mist, Office Tigers, Day Break: Season 1, Painkiller Jane: Season 1, Noble House, Black Legion, PU-239, Fingerprints, Wristcutters: A Love Story, Tripping the Rift: The Movie, and Upright Citizens Brigade: ASSSSCAT. Wallstrip takes a look at Netflix and the results are hilarious. 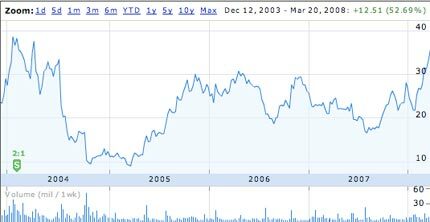 It's been a wild ride for Netflix shareholders over the past few years (see the Google Finance chart below), and today Netflix hit $38 per share. Cantor Fitzgerald upgraded Netflix to a "Buy" with a new target of $41 per share (up from $24 per share). The firm says Blockbuster's (NYSE: BBI) recent initiatives to refocus on the profitability of its retail operations has created a significant window of opportunity for Netflix. Cantor cites Netflix's competitive advantages as scale, logistics expertise, and usage data, and believes that the market is not yet pricing in the possibility of this window being open for "a significantly longer period of time" than previously expected. Cantor notes that Netflix currently has about 30% or more of its float shorted, possibly suggesting that the Company's uptrend could be intensified by a short squeeze. 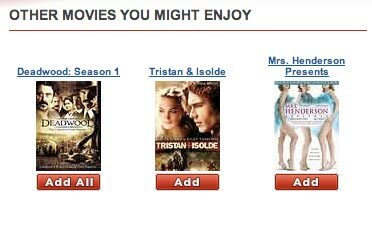 Disclosure: I do not own shares of Netflix or Blockbuster.